Ampil Clinic is located in Bongkoung Village, Ampil Commune, Siem Reap District, Siem Reap province.It is on the North-East of Siem Reap town and 23 km from the provincial hospital. There are 10 villages with 7132 people, 3636 women, and there are 836 children. There are 01 nurse and 04 staffs working in this clinic to help the people. Most of the illnesses in this clinic are Diarrhea, Malaria, Cough, fever and cool. 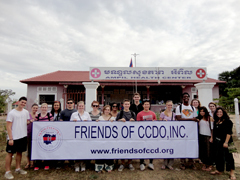 CCDO set up this project to help and support to this clinic with the birth control project, materials for women giving birth and some of medicines and we send our volunteer to this clinic every year to improve the health care education to the staffs and the villagers. The project work involves setting up and running educational workshops on general health and hygiene practices. These are aimed at child-careers, teachers, children and their parents. You will be directly involved in setting up and implementing these workshops to create a fun and interactive, informal environment. The program will ensure that these communities will be better prepared to care for and protect their young children from general illness and will offer advice on how to live in a healthy environment.